Another 5 stars, 5 goals performance from the 3 Lions of England away at Montenegro, they defeated their opponent 5-1 on the night, to hold on to the top spot of group A. It was a back-to-back 5 goals scored by the English national team, the 1st one since November 1984, 35 years ago. It could be recalled England put 5 past Czech Republic in their 1st group A match. The last time England scored 5 or more back-to-back in a competitive match was 35 years ago in a FIFA world cup qualifier. England had defeated Finland 5 nil at the London Empire Stadium in a group 3 tie, with goals from Mark Hateley(2 goals), Tony Woodcock, Bryan Robson and Kenny Sansom, and then defeated Turkey 8 nil away in the next match, goals from Bryan Robson(hat-trick), Tony Woodcock(2 goals), John Barnes(2 goals) and Viv Anderson. England started their EURO 2020 qualifier against the Czech Replubic at Wembley Stadium on Friday night on an impressive note, putting 5 past their visitor. A man of the match performance for England ace, Raheem Sterling, who scored his 1st England hat-trick on the night. The flood gate opened midway through the 1st half on the 24th minute through Sterling, when he poked in from young and lively Jadon Sancho and the 2nd goal in injury time of same half, Harry Kane’s 45+2 minute spot-kick made it 2 nil for the 3 Lions. Sterling completed his hat-trick with a 2nd-half, 7-minute double in the 62 & 68 minutes respectively to make it the scoreline 4 nil to England. An own goal by Czech’s Tomas Kalas to make the score 5 nil capped off a spectacular night for England manager, Gareth Southgate and his lads, and an awful evening for the Czech Republic. Raheem Sterling and England picked up from where they left it, with another classy come-from-behind 5-1 victory away at Montenegro. It was a night for youngsters and new England invitees, both Declan Rice and Callum Hudson-Odoi justified their inclusion in the starting line-up with a commanding display. However, it was another England lad that owned the night, Ross Barkley had arguably his best performance in an English jersey, with 2 goals and an assist to earn the man of the match. Having only won 1 out of 4 previous meeting against Montenegro, England went behind as early as 17 minutes when Marko Vesovic finished off a fine marauding run with a curling shot past Jordan Pickford in goal for England. Nevertheless, the visitors settled their nerves and git their equalizer 13 minutes later, Everton defender Michael Keane nodded home from Ross Barkley’s free-kick. It was all England from there on, Barkley took the game away from Montenegro with a quick-fire double in the 38 & 59 minutes respectively. Harry Kane and Raheem Sterling got in on the act with goals on 71 & 80th minute respectively. 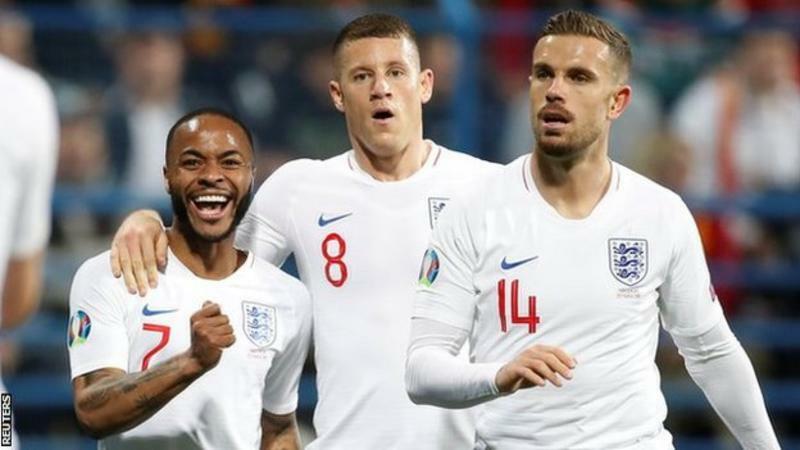 Unfortunately, a delightful footballing night was dented by a racial abuse towards English players from the home fans, Raheem Sterling and Danny Rose were subjected to abuse during the match. With a tougher stance and punishment yet to be dished out by UEFA, football is likely to continue to suffer from this menace. The English national team followed up a remarkable World cup and Euro Nations League performances with a fine start at the EURO 2020 qualifiers, and sit comfortably 1st in group A, 4 points ahead of nearest rival, with 10 goals scored and 1 conceded after 2 games. One thing working for England is the emergence of exciting youngsters, players like Jadon Sancho, Declan Rice, Callum Hudson-Odoi, James Alan Tarkowski etc will certainly provide depth for Gareth Southgate’s team, a pool of talented young players to select from, a good headache/problem so to say. The future is bright for the English national team, surely. Thank you all for taking the time out to read my blog.